Bonnie has been involved in sports and athletic pursuits for several years, and considers herself an ‘athlete for life’. Bonnie trains to stay fit and strong for both her career as a Firefighter, and to compete in various sports and athletic events. She was a national level rower from 2001 - 2005, and a member of the Canadian Olympic Rowing Team in 2004. Since then, Bonnie was Champion at the Canadian World Xtreme Fitness Challenge in 2005, placed Top 5 as a figure competitor in 2008 and 2009, and achieved Brown Belt status in Kickboxing. 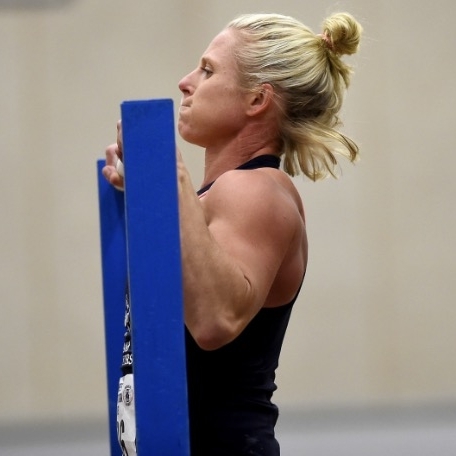 Bonnie enjoys strength and conditioning training for both firefighting and the World Police and Fire Games, at which she took Gold at the Toughest Competitor Alive event. Bonnie has been a Popeye’s Victoria customer for over 15 years. She believes in the importance of nutrition and supplementation to maximize the results of her training. Bonnie often consults with the owner Chris and the other knowledgeable and friendly staff on what supplements will help fuel performance, health and well being. “Sport has taught me that challenging yourself both physically and mentally to push beyond your limits in order to achieve your goals takes hard work, dedication and a positive mindset. I am truly thankful for the opportunities, experiences and skills that sport provides and especially thankful for amazing parents, coaches, teammates, friends and organizations for their support over the years. I also believe in the importance of positive role models and community involvement, and am proud to be a Popeye's Victoria Athletic Ambassador. Popeyes Supplements Victoria has very knowledgeable and friendly staff. Their supplement selection is very extensive so I can find everything I want to help keep me in great shape during training camps. My entire life I have been the most competitive person I have ever met, and was drawn to the competition of sports from a young age. Growing up in Fort st. John I played every sport I could be registered in through elementary and middle school before focusing on soccer in highschool and playing Div 1-3 on as many teams as I could year round. When I graduated highschool my family moved to Victoria so I could pursue post secondary education and UVIC with my plans of earning a scholarship playing on UVIC’s soccer team. Upon arrival and entry into the Victorian soccer scene I was informed by several different coaches that while my soccer skills were adequate enough play for UVIC, my conditioning needed to be improved. Taking a suggestion from a family friend, I registered at a local MMA facility to train in its martials arts conditioning program under Jason Heit. At the end of my very first day and boxing class I knew I never wanted to play soccer again. Now, seven years and twelve fights later, under the tutelage of my manager Jason Heit and coach Nate Olson, I have proven myself to be the best Cruiserweight and Heavyweight amateur boxer in the province under Boxing BC, winning the 2015 British Columbia Heavyweight Golden Gloves title, the 2015 Provincial title and qualifying for Team BC. Following my first amateur match 3 years ago, Chris Kinnear from Popeye's Supplements approached me to discuss the idea of a supplement sponsorship, without hesitation I agreed. Ever since then, Chris and his staff have built, modified and maintained a deeply personalized supplement and nutrition regimen tailored specifically to my training and lifestyle needs. I moved to Victoria from up island almost 11 years ago and my first step was finding a gym, in which I found immediately and my second, and equally important step was to find my supplement store. I can't remember if Popeyes was recommended to me or if I just happened to drive by, but regardless Chris was working, and if any of you have had the pleasure of meeting Chris I won't NEED to say it but I will anyway...His friendliness and insane knowledge pulls you in and you don't want to leave. First Popeyes experience and I was hooked. Ihad found someone I trusted 100% with my supplement coaching. Now 11 years later as a full time personal trainer and competitor I don't dare send my clients anywhere other than Popeyes. If Chris isn't working, I never worry that my clients will be getting a lack of knowledge or help with their purchases, as He does an INCREDIBLE job of educating and hiring extremely supplement and nutrition savy employees, who I trust as if they were Chris. Not only does the staff have the knowledge they are kind and welcoming to EVERYONE, which as a woman walking into a supplement store for sometimes the first time, can be intimidating, and everyone in store makes you feel at home. I am sponsored with my favorite supplement brand ( and I am not just saying that, I actually used them prior to sponsorship lol) and so my favorite products from Popeyes are typically MAGNUM NUTRACEUTICALS. Thanks again Chris for all your help of the years! It is difficult for Lauren Babineau to remember a day in which she has not been active in some way… Her eagerness and enthusiasm have often earned her the nickname energizer bunny or Babs bunny. From a young age, Lauren naturally adapted to a fast-paced and active lifestyle. Triathlon being not one – but three sports – fits Lauren like a glove. However you can also find her doing anything physical and exciting – trail running, riding, hiking, rock climbing, paddleboarding, and dirt biking, are just a few examples. “As a passionately driven (tri)athlete my goal is to always be my best. When I enter a race, my goal is to be on the podium – anything less is a shortfall in my mind. Nutrition is often considered the fifth discipline triathlon. I take my nutrition seriously, as I believe it has a direct relation to my performance. Working with Popeye’s Victoria is an essential part of my training program; Chris and his knowledgeable staff give me peace of mind every time I line up on a start line". Kevin was born and raised in England UK and moved to Victoria, BC in 2004 after serving 22 years Color Service with the British Army. Kevin has been involved in Fitness from a very early age, playing English Football from the age of 4. He is a qualified personal trainer who worked with Club Phoenix from 2004 – 2008 before moving to work with the Saanich Police Department. Kevin competed in his very first triathlon, a sprint race, in June 2014. After getting ‘the bug’ he is now a multi-Ironman Finisher with races including Ironman Canada and Ironman UK under his belt. In 2017 Kevin was honored and privileged to represent Canada in his age group (55-59) at the ITU Worlds in Penticton. His goal is to qualify and race in Ironman Worlds in Kona, Hawaii. All the Triathlons he competes in are inspired by an amazing charity, Cops for Cancer Tour De Rock (Kids dealing with Cancer). His goal in each race is to cross the finish line and raise as much money as possible for the charity. Kevin has been a Popeye’s Victoria customer for over 15 years and is a big believer in maintaining a well-balanced and healthy lifestyle. He recognizes the importance of supplements to maximize his results during training and competition. Kevin often consults with the owner, Chris, and the other knowledgeable and friendly staff on what supplements will help fuel performance, health and wellbeing. P.S. Sports and in particular Ironman has taught me to push my boundaries both mentally and physically and have self-belief in what I can achieve. I have had the opportunity to meet, train with, be trained by and compete with so many amazing people, who have been such a great part of my successes. I started playing lacrosse when I was 7 years old. I have my friends to thank for introducing me to the sport, some of whom I still play with to this day. 19 years later I am fortunate enough to have made a career out of the sport I love. The relationships and experiences I have created over the years of playing Lacrosse is what I am the most thankful for. Chris Kinnear (former Pro Lacrosse Player) is someone I watched frequently growing up when he played for the Shamrocks. The man had “No Fear” and would do anything for his teammates. I like to think I bring the same attitude to my team. The approach and dedication that Chris takes to his training is something I admire, and I want to utilize more of those concepts in my own training. I am thankful for Chris and the opportunity he has given me to become a brand ambassador at Popeye’s Supplements Victoria. He supplies me with exactly what I need to train, play and rest properly. I hope one day I am able to give back to the Victoria community the way he has.